[Go Back] [New Search] Details for Kotozuka Eiichi (1906-) "Takao in Rain"
Impression Hand painted on silk. Condition Very good ... Slight foxing. The right top corner is pasted on a presentation paper. 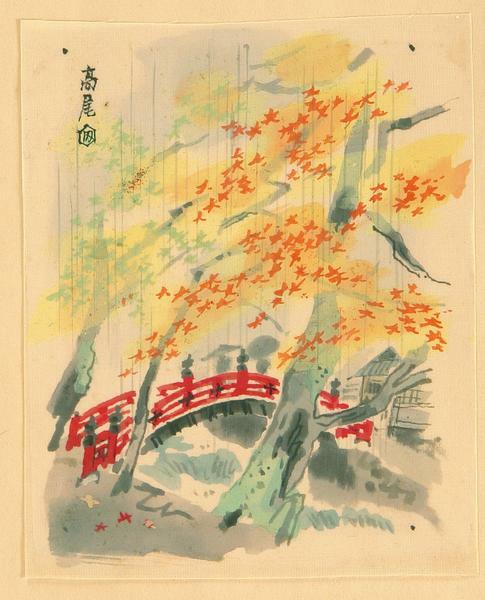 Notes: A very fine original painting of a maple tree and a red bridge in Takao in autumn. This design was published later as a print. It has been kept in the famous publisher in Kyoto, The Uchida, archives. An exceptional and rare item for the serious Japanese woodblock print collector.